Passengers wait to check in at Chicago's O'Hare International Airport in June 2015. TSA screenings at U.S. airports are beyond ticket counters, baggage claim and other heavily trafficked areas. After terrorist bombings at the Brussels airport targeted those areas, U.S. officials are reconsidering how to keep them safe. The airport in Brussels will remain closed until at least Saturday after the attacks there, and security at U.S. airports is on high alert. Security experts, politicians and travelers alike say the Brussels bombings exposed a weak spot in airport security, between the terminal entrance and the screening checkpoint. "If you think about the way things were done in Brussels — and have been done in other places — literally people have to only walk in, and they can attack at will," said Daniel Wagner, CEO of security consulting firm Country Risk Solutions. While many Americans might identify the federal Transportation Security Administration with protection of airports, the agency's responsibility is often limited to the security checkpoints and beyond. 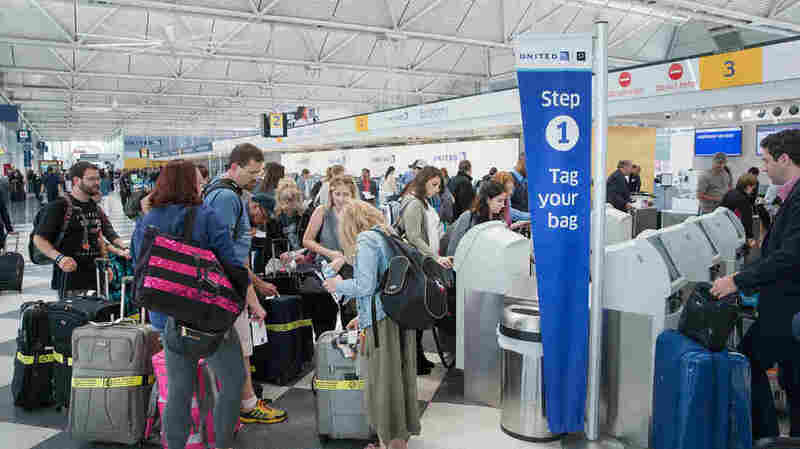 And maintaining security at the curb, check-in kiosks and baggage carousels can be left to a wide range of groups, said Massachusetts Rep. Bill Keating, ranking Democrat on the Foreign Affairs Subcommittee on Terrorism. "Sometimes it's private security, sometimes it's local police — hired out, paid for by the municipal or airport authority, whoever runs it," he said. "And that jurisdiction is not clear, the way it should be." Wagner suggests U.S. airports establish pre-terminal screening before travelers enter the facility. "That is a common approach in many countries around the world — you cannot even get in the terminal until your bags and your person have been pre-screened," he said. "That is, through an X-ray machine both for the bags and for the individual." Enhancing security to that degree would be costly, and Wagner says he's not sure he sees a great enough sense of urgency yet for Americans to be willing to pay for it. In addition, such pre-terminal screening could create long lines outside of terminals and bottlenecks of traffic congestion. Keating sees random checks as a possible, less-intensive alternative. He says he requested a Government Accountability Office study on how to improve airport perimeter security a year ago, and expects it to be released soon. Lisa Paley, 50, who was returning home to New Jersey from a business trip to Chicago, said that she thought U.S. airport security was good, but knew it wouldn't stop a Brussels-style attack. "I think we have to acknowledge we're in a situation which is always changing, and I think that they're gonna have to continue to look at what security means at the airport," she said. Dan Cicero, 42, who was traveling to Wisconsin from Chicago's O'Hare International Airport on Wednesday, said that as far as he was concerned, more security is better. "I'm not talking guys with machine guns or anything like that, but more — and maybe more of a police presence," he said. But most experts agree it's nearly impossible to make public airports completely secure from terrorist attacks — especially when those terrorists are willing to take their own lives when taking the lives of others.